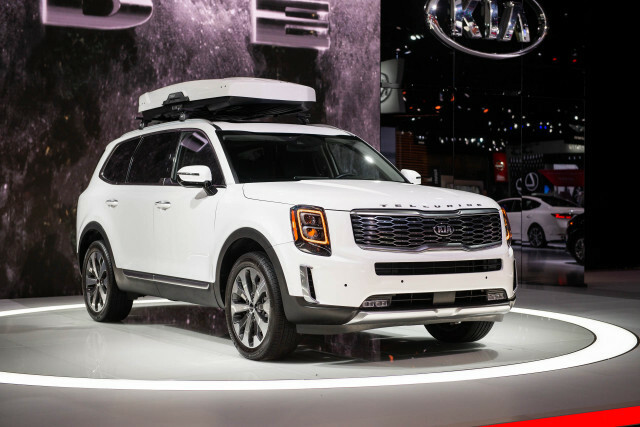 The 2020 Kia Telluride that debuted Monday at the 2019 North American International Auto Show in Detroit is a tardy but stylish entry into the competitive field of big three-row crossover SUVs. 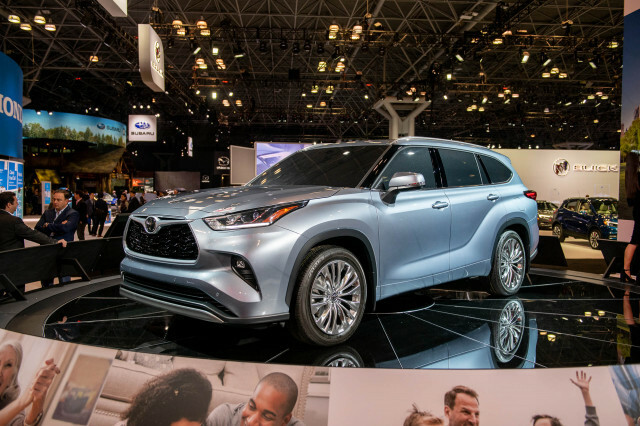 When it goes on sale later this year, the 2020 Telluride will tempt buyers out of established rivals such as the Honda Pilot and Toyota Highlander with its attractive lines and its wide array of available tech features. Kia's been here before, but with a very different big crossover SUV. The short-lived Borrego that bowed just in time for $5-a-gallon gas and a global recession has little in common but the number of rows of seats with the eight-passenger 2020 Telluride. 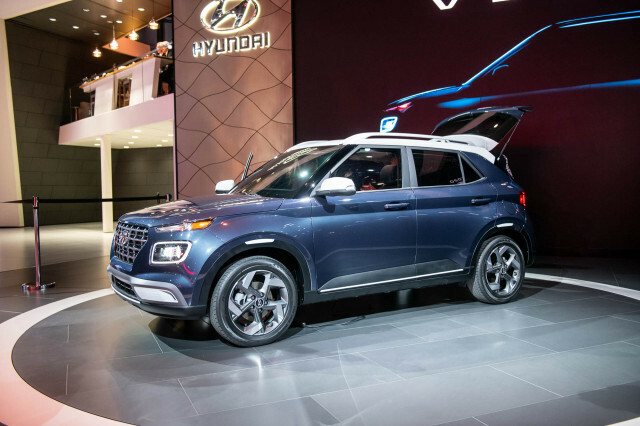 Instead, the Telluride shares its platform, its engines, and most of its features with the 2020 Hyundai Palisade. 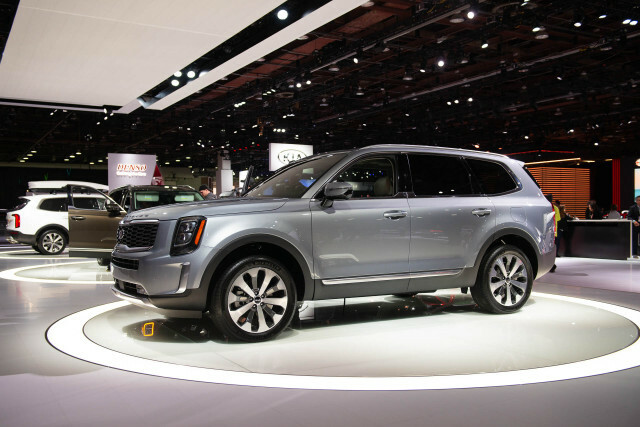 The 2020 Telluride uses unibody construction and a four-wheel independent suspension. Under its hood sits a 3.8-liter V-6 engine rated at 291 horsepower and 262 pound-feet of torque that sends power to either the front or all four wheels via an 8-speed automatic transmission. That setup is good for a maximum towing rating of 5,000 pounds, which is more than many of its competitors. Don't look for the Telluride on a rugged mountain trail, however. 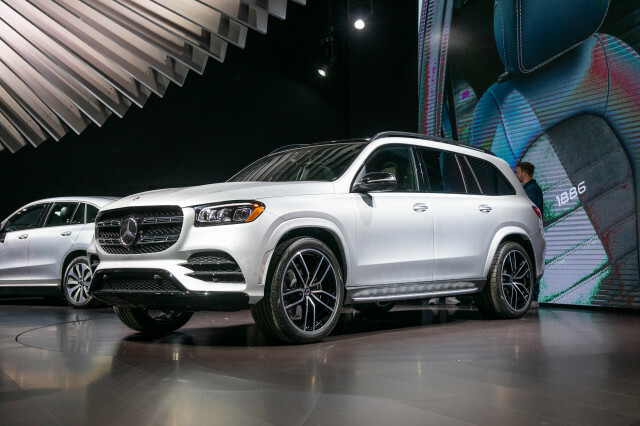 Its optional all-wheel-drive system features a snow mode for wintry conditions, but none of the off-road trickery seen in more traditional SUVs. Instead, the Telluride is more about pampering its passengers. Set to be available in LX, EX, S, and SX trim levels, the big crossover SUV comes standard with a reclining third row of seats. A three-seat bench is standard for the second row while captain's chairs are optional. Rear-seat climate control with separate switches in the headliner are standard, as are five USB ports. A sixth USB charger is optional, as are tech surprises like a Bluetooth system that can connect to two phones at once and switches that can turn of the speakers in the second and third rows to concentrate audio up front for parents while the kids use headphones or nap. The driver can get the attention of riders in the back via an intercom that uses the standard Bluetooth microphone up front to project mom or dad's admonitions to misbehaving kiddos. Kia hasn't said how much space warring kids in rows two and three will have, but the Palisade's 18 cubic feet of cargo space behind the third row and 46 cubes with the rearmost seats folded offer a good hint. The Telluride has a flat, low dashboard and offers a 10.3-inch touchscreen for infotainment as an option. Apple CarPlay and Android Auto compatibility are standard fare. A 630-watt Harman Kardon audio system with 10 speakers is optional. 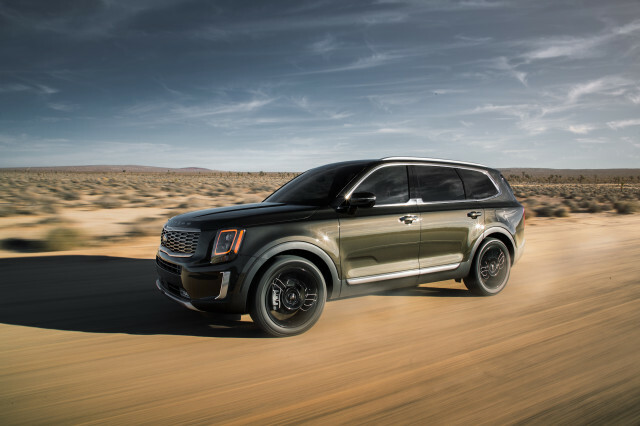 Like most—but not all—rivals, the 2020 Kia Telluride doesn't skimp on advanced safety tech. Automatic emergency braking with pedestrian detection, lane-departure warnings, active lane control, adaptive cruise control, and rear cross-traffic alerts are standard on all. versions Blind-spot monitors, a head-up display, and high-beam headlights are optional. 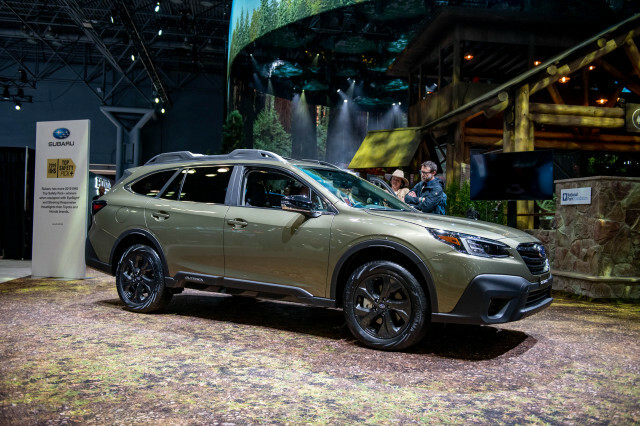 One new trick the Telluride brings to the segment is an advanced child safety lock system that watches for traffic coming from behind and keeps the rear doors latched until a potential crisis can be averted. 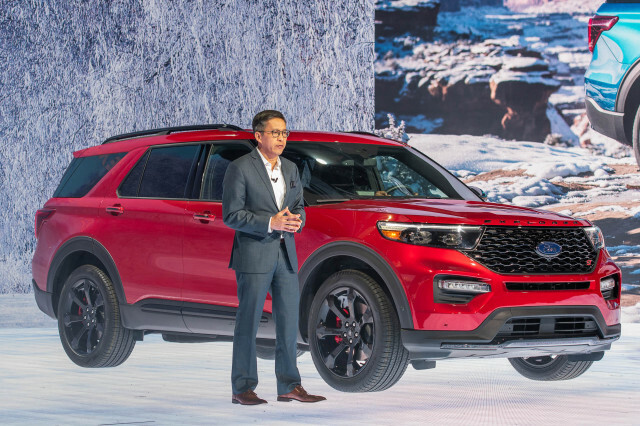 Kia's holding off on pricing and fuel-economy ratings until closer to the Telluride's on-sale date later this year.